This Italian favorite tastes homemade! Our recipe is loaded with cooked ground beef, tomatoes, zesty seasonings, onion, eggs and five cheeses - Mozzarella, Monterrey Jack, Ricotta, Parmesan and Romano. Just heat and serve for a quick and easy meal. From Frozen:�Oven: Preheat oven to 350�.Carefully remove film from tray before baking. Place frozen tray of lasagna on a baking sheet in the center of the oven. Bake 55-60 minutes or until internal temperature reaches 165�F. Remove from oven and let stand 5 minutes. Slice and serve�Microwave: Remove tray from box and cut small slit in center of film. Place frozen tray in microwave and cook on medium high for 9-10 minutes or until internal temperature reaches 165�F. Remove from microwave with oven mitts and let stand 5 minutes. Carefully remove film, slice and serve.�From Thawed. Thaw in refrigerator overnight.�Oven: Preheat oven to 350�.Carefully remove film from tray before baking. Place tray on baking sheet in the center of oven. Bake 35-40 minutes or until internal temperature reaches 165�F. Remove from oven, slice and serve.�Microwave: Remove tray from box and cut small slit in center of film. Place thawed lasagna in microwave. Heat on high for 4-5 minutes or until internal temperature reaches 165�F. Carefully remove film, slice and serve. 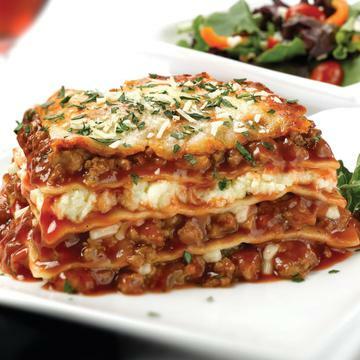 Ingredients: Lasagna Noodles (Enriched Semolina (Wheat, Niacin, Iron, Thiamine Mononitrate, Riboflavin, Folic Acid), Water, Egg Whites), Water, Tomato Paste, Beef Treated With Irradiation, Part Skim Mozzarella Cheese (Pasteurized Milk, Cheese Cultures, Salt, Enzymes), Ricotta Cheese (Pasteurized Whey, Pasteurized Milk, Cream, Vinegar), Onions, Monterey Jack Cheese (Pasteurized Milk, Cheese Cultures, Salt, Enzymes), Whole Eggs, Parmesan Cheese (Pasteurized Milk, Cheese Cultures, Salt, Enzymes), Romano Cheese (Pasteurized Organic Cows Milk, Cheese Cultures, Salt, Enzymes), Salt, Sugar, Granulated Garlic, Spices, Citric Acid, Modified Corn Starch, Xanthan Gum. Contains: Milk, Eggs And Wheat.